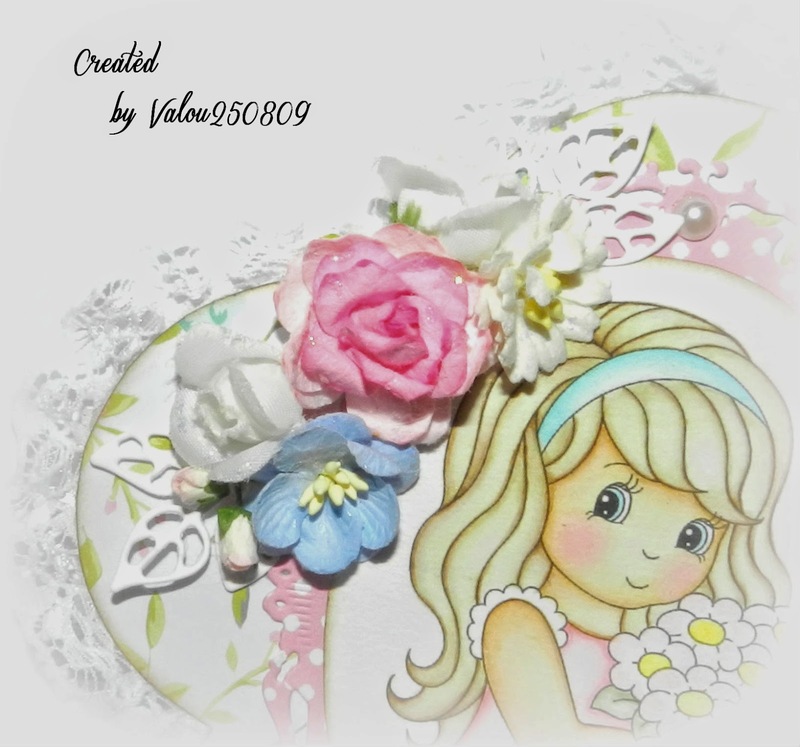 Whimsy Stamps Challenge Blog: Valou - Inspiration Card "Stampart with Kathryne"
Valou - Inspiration Card "Stampart with Kathryne"
Valou here for my Inspirational Post. For this card, I used a flowery paper and a fall of white polka-dot pink paper. Any goshawk, I stuck of the white lace. 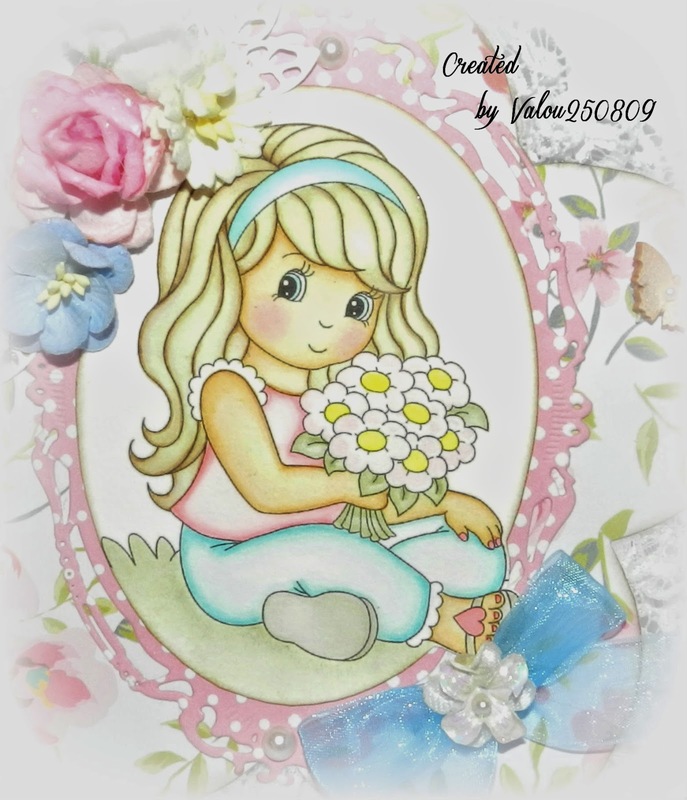 I used an image " Stampart by Kathryne " of "Whimsy Stamps". - Ink "Distress Tattered Rose" and "Distress Vintage Photo" for the skin. - Ink "Distress Antique Linen" and "Distress Walnut Stain" for hair. - Ink "Distress Worm Lipstick" and "Distress Mahogany" for cheeks. - Ink "Distress Bladed Sage". - Ink "Distress Tumbled Glass". - Ink "Distress Spun Sugar". - Ink "Distress Worm Lipstick". - Ink "Distress Pumice Stone". I cut it then stuck on a die-cut realized with a dies " Spellbinders-Nestabilities - Majestic Ovals ". For the decoration, I added a pink rose (30 mm), a blue flower of cherry tree, a flower white "Daisy", two cloth white roses and buttons of roses. In these flowers, I added die-cuts "Leaves" realized with a dies " Lily of The Valley ". Flowers are decorated with some touches of "Glitter Stickels Icicle". 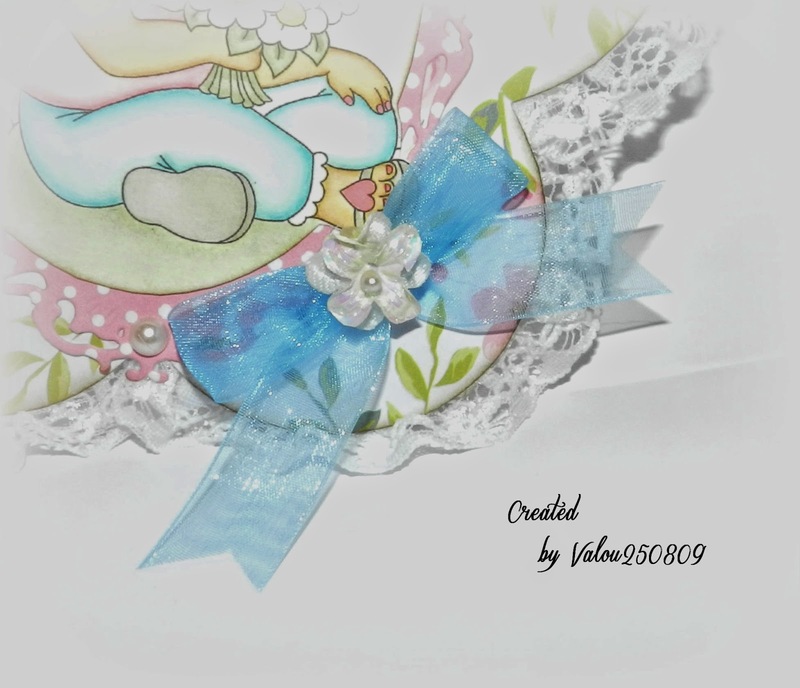 Finally, I added a bow which I realized with a piece of ribbon " blue Organza ". I decorated it with a small cloth white flower. Thank you for your passage here and wishes you an excellent day! Challenge 70 - Anything Goes!